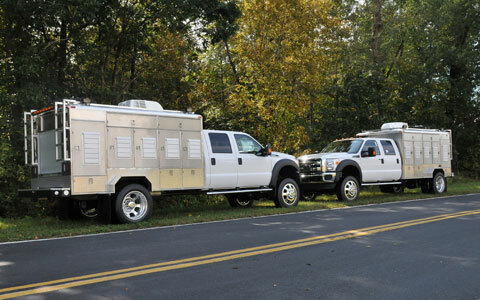 Jackson Creek Mfg., Inc. is proud to offer the finest Stainless Steel Working Dog Truck Body Kennel in the industry. 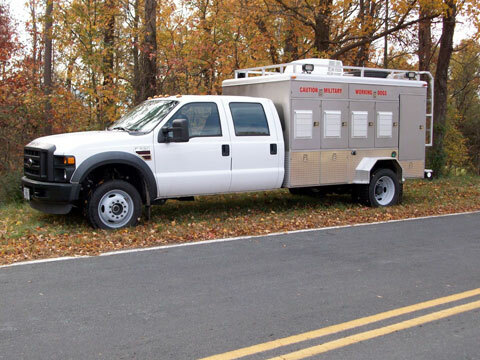 This unit has been designed to meet the needs of Working Dogs under the harshest of conditions. Fully Insulated, Double Wall Construction. 4" insulation overhead, 2" insulation under floor, 1" insulation on front, 2" insulation between kennels and generator compartment. Rear Generator Closet with doors on both sides and a rear roll up door to allow access to generator for maintenance. Lower Storage Boxes from bottom of kennels to bottom edge of cab with slam shut doors, cable door stops and safety latch that can be padlocked. 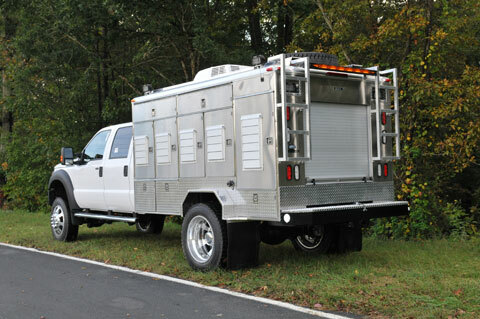 Tread Plate Rear Bumper with Class III receiver trailer hitch and 7-pin RV trailer plug. Bumper is hollow with a lid and gas struts. Bumper interior contains an automatic water pump, two coiled water hoses with nozzles and quick connect fittings. Quick Connect water outlets and the water fill connector are located on exterior sides of the bumper. Rubber Grommets and wire protectors on all electrical wiring.